Will Divorce Affect Your Credit Score? Many people suffer credit damage after a divorce, but it’s not because of the divorce itself. After all, your marital status isn’t included on your credit report and it's not factored into your credit score. So the physical act of separating from or divorcing your spouse won’t impact your credit score. While the act of divorcing doesn't directly hurt your credit, a divorce could indirectly lead to financial troubles that do hurt your credit. For instance, losing one of two household incomes could cause financial strain that leads to missed payments on your credit cards, loans, and other bills. Since payment history is a major factor in your credit score, missing payments can cause your credit score to drop. 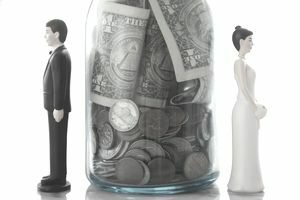 Divorce could hurt your credit score if payments aren’t made on accounts you hold jointly with your ex or soon-to-be ex. In some divorce proceedings, the judge declares one spouse responsible for the joint debt. That spouse fails to make payment and the creditor adds the late payment to both your credit reports. Despite what's in your divorce agreement, the original credit card or loan agreement still stands. Any missed payments will affect everyone who's listed on the account. In some cases, one spouse intentionally hurts the other person’s credit, out of spite or revenge. Remember that payment history and level of debt are the two biggest factors affecting your credit score. Maintaining a positive payment history and minimizing your debt during and after the divorce are key to keeping your credit score in tact. Here’s what you can do to maintain your credit score during and after the divorce. Adjust your lifestyle to your reduced income. When you've been used to living on two incomes, downsizing your life to fit one income can be tough. It often requires some major life changes. That may mean selling your house and buying a less expensive one. It may mean moving to an apartment. If you can no longer afford your auto loan payments, you might refinance the loan or sell the vehicle and buy a less expensive one. You may have to reduce the grocery bill, eat out less, and cut out cable television. Having a solid spending plan can help you adjust. Create a budget (or modify your existing one) to figure out what you can and cannot afford. Prioritize your most important expenses and keep up the payments that have a direct impact on your credit score, e.g. loans and credit cards. Try to cover your primary expenses out of your income, not including alimony or child support. Some vindictive ex-spouses may skip payments, try to have the amount reduced, or even quit their job to spite you. It might be difficult to live as though you’re not depending on those court-ordered payments, but if the payments ever stop, you’re already prepared. Deal with your joint debts. Sever your financial ties to your spouse as soon as you realize divorce is imminent. It makes the financial transition much easier. Review your credit report and use recent billing statements make a list of all accounts that are jointly held. Close these accounts, in writing and by phone for extra protection, and ask the creditor not to re-open them. Each ex-spouse should work to get the debts they’re responsible for in their own name by refinancing loans and transferring credit card balances to another credit. If you and your spouse can’t work out these details together, perhaps the attorneys can reach a better agreement. In the meantime, try to keep making at least the minimum payments on the accounts that affect your credit. Otherwise, the court will have to make a final decision about debt responsibility. It sounds insensitive, but for your credit’s sake, don’t trust your ex-spouse to make payments on accounts that have your name on them. That includes mortgages and car loans, even if your spouse is still living in the house or driving the car. Often, people aren’t as responsible with financial accounts that don’t directly affect them. Stay on top of payments. If your spouse is responsible for paying accounts in your name, keep track of the due dates and check for payment as the due date approaches. To protect your credit, you may have to make the minimum payment. Ask the judge to have your ex-spouse repay you for the payments you made. Credit monitoring is often recommended as a way to find out about late payments. However, by the time a credit monitoring service alerts you to a late payment, it’s already been added to your credit report. Since late payments aren’t reported to the credit bureaus until they’re 30 days late, you have time to pay before your credit is affected, but you have to catch it first.